This morning brought the mesmerising sound of water dripping from the gutters. The long awaited thaw had begun. Its amazing how the little things that you once did automatically can now bring you out in yelps of euphoria. 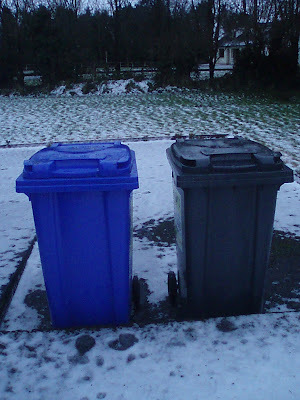 Today I put my rubbish outside in my bins. Halleluia! Yes you heard me correctly. This may not seem like a big deal. But let me assure you. When your bins have been welded shut by ice for the past week and your Christmas excess is building up in the kitchen, then you will be over the moon when that wheelie bin lid cracks slowly open. And if you think I'm overreacting now, just wait til I get a toilet that flushes automatically rather that having to manually fill the cistern with water from a bucket circa 1930!